This may be a dumb question but what do you eat when backcountry camping for a weekend. I have never backcountry camping, only campground camping. I know you do not take a cooler with soda and brats and chips. So what kind of meals do you eat? Generally speaking, anything from the grocery store that is 'open and eat' type nuts, berries, granola, etc. Although many people repackage into something re-sealable. You can enjoy Coffee, Tea, Hot Chocolate, and any other drink mix you like. There are also energy bars galore on the market now, and I usually have two a day while camping or hiking. Most things from the grocery store that are 'just add water' and are simple to cook, again most people repackage to get rid of excess cardboard, paper, etc. save the instructions! You can use sturdy Ziplock type bags or even use a vacuum sealing machine for repackaging. There are several different brand / types of commercially prepared freeze dried meals just for this application. These come in a lightweight, durable, re-sealable pouch, you simply add hot water, let sit, and enjoy, right from the bag if you wish! One popular brand is Mountain House. If you get really hungry you can boil your boots, but I haven't tried it. I will say that creativity plays a large role in what I take, sometimes I even freeze a steak and carry a baking potato for my first meal at camp. You will find that there are different ways to carry and prepare food, everyone has their own 'system' from complicated to simple. There is a review section right here on Trailspace for Food & Drinks, check it out and you will get a lot of ideas! Here is a link. Thanks for the reply. I will check that link out. I'm not sure if I can live on "Trail Mix"(now I know where that term comes from LOL) and granola bars for a weekend though. Yeah trouthunter covered about what I use as well. Oatmeal packs are great. Coffee wise I have started to use the single cup packets(tea bag like)and they work well. Occasionally I will even bring out military MRE meals. You can get them by the case(fairly cheap)if ya look around and are pretty much heat & serve. 2 of my best investments have been a food dehydrator and a vacuum sealer. You can eat almost anything you would eat at home, but most people carry dried versions of home meals that they either buy or make and package themselves. You can make pasta dishes, stews, etc. There are many websites and books on backcountry cooking, so start looking online. One I recommend is www.trailcooking.com. I've even carried frozen steaks with me, but don't recommend it unless you are staying at a hut or can cook on an open fire, which is either not practical or banned in many places. Forget things like soda, brats and chips (well, maybe not brats). You want food that supplies lots of protein and calories. Dried fruit, energy bars, dried meats and fish make good snacks. Meals like MRE's will work (military packaged meals), but are heavy. Start looking in your supermarket. You can find packaged, dried meals that are cheaper than what you'll find in a camping store. Freeze dried food that you soak, then cook saves fuel. Avoid the microwaveable "packaged" meals as well - these are the ones next to the Chef Boyardee / Spaghettios in the store. They look tempting, but the weight and cooking them in water takes forever. I've been using the Healthy Choice pastas that require you boil the pasta, drain, and then add the chicken/sauce in a packet. These do take a while to cook, but are very nice & much healthier than some of the alternatives. If you're only going for a weekend you can eat bratwurst, steaks, eggs, bacon etc. I often do gourmet three day trips, just acknowledge that fried goose requires a skillet and oil. The wine bottle is heavy and you need a cork screw. The salad dressing should be put into a small plastic container and use zip locks and such for egg beaters and pretossed salad. You can fry a steak in a pan over a fire, in fact an aluminum skillet may be the most important item for really good food. A cheese dip and crackers is a good lunch for hiking. Add some celery - precleaned and in a ziplock. Pasta is great on a stove, simply boil pasta and heat premade sauce that you can buy at the store in a plastic pouch. When you carry in 35 pounds and eat everything and carry out a 20 pound pack, you've eaten well, and you will relish the light pack going out. I suggest hiking down going in and up coming out. Even maybe get a roasted chicken and take a loaf of french bread and napkins and soap. Nobody has talked about tortilla shells...they are good for lunch and dinner stuff. Good ideas for filler are tuna with mayo packs with a wrapped cheese. Eggs will last a couple days. Rancho Huevos--fried eggs with cheese and salsa is a good breakfast or dinner. Peanut butter and honey or packets of jam are really tasty. A good dinner my fam loves is the "just add water" potatoes. They have several flavors. We have used "smokies" or substitues, prefried bacon, chicken packs, etc. as the meat. You could even take frozen hamburger, fry it up, add to the potatoes, and mix in cheese--camp cassarole. Especially for a weekend, you really don't have to go super light. And, BTW, I HAVE done the steak a couple times. Oh, what feast the first night out :) Clif bars (my favs are the Mojos) etc are good choices to add to your list. Choc covered raisins are a great pick-me-up when hiking, and make a nice "finish" as dessert, too. Read all the forums...if you like the backpacking, you can learn to dehydrate almost any meal, eat for pretty cheap and pretty nutriously, and not "conk" from lack of calories. I like the Lipton/Knorr just add water meals, like Cajun Rice and Beans. I take some freeze-dried veggies to mix in, and one of those foil packs of tuna or salmon (not the cans, too heavy.) Mac and cheese or shells and cheese is a big favorite also. The kind they call deluxe, where the cheese mix is already prepared, so you don't have to fiddle with milk, butter, and cheese powder. I repack the mac and cheese into zip lock bags. The Lipton/Knorr dinners are fine in their own foil pouches, and in fact I have poured boiling water into one and let it sit until cooked, then eaten it right from the pouch -- saves some clean-up time. For the first night out, it's fun to prepare an omelet at home -- mix up the eggs, add whatever you like (onions, cheese, mushrooms, whatever), and then put it in a zip lock bag. Make sure it won't get squished in your pack! Then at mealtime, put water in a pot, put the bag in the water, open the top so the steam can get out, and your omelet will cook in what is basically a double-boiler. Eat it from the bag if you like, I usually do. Packaged oatmeal for breakfast is standard in my crowd, although granola makes a nice change. Get some Goober Grape (has the peanut butter and jelly together), repackage in lighter plastic container, and spread it into pita pockets for lunch -- mmm. Cheese will last a surprisingly long time, and you can slice off any mold from the outside -- the rest will be fine on the inside. Harder cheese lasts longer than softer. Make your own trail mix so you can change it around -- keeps the gack factor down. 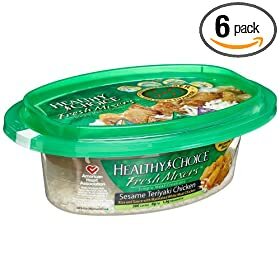 These are so good and so inexpensive I cook with them a lot at home also -- makes quick and easy meal prep a breeze when I'm low on time or energy. I keep one quart plastic bag with a mix of the five veggies (minus potatos, which don't go well in many dishes), and another of the potatos, handy at all times. When I go camping, they slide easily into the food bag with whatever else I am going to eat. Mix a handful in with ramen -- put them in as soon as you put the water on to boil and they will be done when the ramen is done -- it is a real taste treat and gives more nutritional value to ramen, at home or on the trail. All of the above are great suggestions. Sometime I will do the "gourmet" weekend trips, especially with the wife & newbies, as this makes for especially enjoyable meals. I typically have these organized by category, as usually, they coincide with when you are going to eat and want them. > Snack type foods are easiest to eat while moving on the trail, or when stopping for lunch, make no mess, and require no preparation or cleanup. > Easy Prepare Foods are perfect for making a little more of a meal at lunchtime, but may require a little preparation, may be a little messy, and cant easily be eaten while hiking. I personally love the vacuum packed meats to serve this purpose, as nothing but dried food gets weatisome day after day. Peperoni is great too and can be used in every meal. The best part is that neither of these has to be refrigerated until opened, and come in small packages. > Foods that require preparation and cleanup (cooking/cleaning) will most often be made at camp in the morning when you get up, and in the evening after arriving at camp. These provide the most warm, tasty, and sustaining meals. Just remember that if you bring perishable foods, you must use them quickly, and they tend to be smelly, attracting uninvited widlife. If the trip is two full days or shorter I'll typically take decent food with me. For breakfast on the first day it usually bacon, eggs, potatoes, and hot cocoa or cider to drink. The second day breakfast is usually something quick like a couple of oatmeal packets and some fresh fruit. Lunches are usually something pretty quick like crackers and summer sausage with some trail mix and jerky. Dinner on the first night is usually some type of meat like a tin foil dinner or I'll take a rice dinner. My favorite dinner in the back-country is beef ravioli from the can. If the trip is longer than two days I usually take a lot of quick foods like ramen and dehydrated meals for dinner. Breakfast is usually oatmeal or fruit and a granola bar. Lunches are usually crackers with summer sausage or my personal favorite, tuna lunch packs that you can buy in the supermarket. I also take a lot more snacks on longer trips like granola bars, trail mix, jerky, Gardettos or Chex mix, and Jolly Ranchers. When I go backpacking all of my meals consist of rice and/or bean side dishes made by Lipton's, Knorr, etc. My "Standard" meal is Red beans and rice. Any of the brands available at the grocery will do, but unless you're cooking for two most will require re-packaging into single serving ziplocks. They're all "add water and cook" dishes that with the addition of a foil pouch of chicken, tuna, or ham make a hearty meal after 12-15 miles of Ozark trails. Spam now sells single slices that are great (if you like Spam!). They're just the right amount to dice up and add to dinner or you can fry them up in the morning in a little olive oil as an alternative to oatmeal. I took fish sticks once. Who cares its just for the weekend! Bring some good stuff, leave the clif bars and powerbar stuff at home because it tastes like crap. I like to make stuff at home in a pot and then measure it out into containers. These are basically one pot meals that you are doing. If you don't have a stove, buy a cast iron pan. Don't want to carry that? Some tin foil, a can of luncheon meat, slices of cheddar and an english muffin make an AWESOME melt when wrapped up and thrown in the fire over some coals. I'm a weekend warrior and don't know much about long distance stuff. So this has always worked for me! 1 minute Quaker oats oatmeal, with sweetened coconut, slivered almonds cinnamon, nutmeg, raisons and Real maple syrup. I don't like the pre-packaged ones, they have way to much sugar for my liking. I will bring some Dehydrated meals along with me if its more than 3 days, I sometimes make my own. I don't mind packing in extra food as I love to eat...a lot! All the posts are good one's. you have to eat well to keep going, food is in most cases the heaviest item you will carry about 2 pounds a day. You need to eat well to sleep well you burn lots of calories when you sleep. One of my favorites is taking dehydrated re fried beans, tortillas, cheese, and your favorite hot sauce. Boil some water mix the beans put all ingredients in the tortilla and you will think that you should open a burrito stand when you get home! you can mix the beans and water in a ziplock or last nights dehydrated meal bag (rinsed out the night before) or a paper plate. Check out the bulk bins at the market or co-op type food stores. If it tastes good at home it will be great on the trail. Thanks a lot everyone for the food comments. It seems like there is a little more planning of meals when out in the backcountry. Its so weird because when I would go car camping its like I dont even have to think about it anymore. Just load one cooler with sodas. Then one with brats, burgers, sandwiches, and eggs, and I'm good to go. Energy: To perform efficiently your muscles require glucose. Complex carbohydrates such as rolled oats breakdown into glucose more quickly than protein and fat. Protein is necessary for muscle repair. It is advisable to consume carbohydrates prior to hiking and at lunch break. Consume protein and fat if preferred after hiking. Otherwise, your blood will be tied-up for food digestion versus your performance. The oils of corn, olive, peanut and safflower contain the highest energy concentration of calories per weight of all foods except lard. Fatigue requires rest and/or water, food or supplement energy intake. Learn which foods and supplements are beneficial for improving your performance. Why? Here's an example from a December hike: I invited a fellow to join me for an afternoon hike into the hills of northern New Jersey. He told me that he had a hamburger for lunch before we left and arrived at trail about an hour later. He took five rest stops within an hour. That's why no protein until you're finished hiking. Therefore carbs, either cooked rolled oats or carb energy bars. You could add berries, cherries, raisins, figs, etc., but no or minimal protein until dinner. I use Bee Pollen for a supplement stored in a 2 in. high plastic bottle. An exaggerated pinch placed under your tung with saliva will dissipate into your digestive system quickly providing about a half hour of solid energy without upper and downer effects normally produced by coffee and sugar. Although, coffee is a good stimulant. You can take brats/hotdogs/bacon. Either eat it on Day 1, or you can add a 4oz block of dry ice, tape it up tightly in two 99cent emergency blankets, stuff it in a ziplock, and keep it out of the sun. I've had steak for breakfast on Day 3 using that method. Eat whatever; just make sure you bring plenty of whiskey. This forum: Older: What do you do when snow makes the trail disappear? Newer: Plus size sleeping bags?